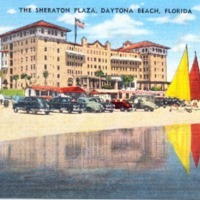 A postcard depicting the Sheraton Plaza, located at 600 North Atlantic Avenue in Daytona Beach, Florida. The building was originally constructed as a cottage for Charles Ballough in 1888. In 1895, Ballough partnered with C. C. Post to convert the building into a hotel called Daytona Beach’s Grand Resort. The new Grand Resort opened in 1911. In 1925, the resort hotel became the first on the east coast of Florida to remain open yearlong. During World War II, the hotel was closed down and converted into a barracks for the Women’s Army Corps (WAC). In 1944, the hotel reopened as the Sheraton Plaza. The hotel now operates as the Plaza Resort and Spa. Original 9 x 14 centimeter color postcard by E. C. Kropp Company: Private Collection of Bob Van Horn. Digital reproduction of original 9 x 14 centimeter color postcard by E. C. Kropp Company. Originally created by E. C. Kropp Company and published by the Murrell Post Card Company. "Experience the Plaza and Daytona Beach." Plaza Resort and Space. http://www.plazaresortandspa.com/experience-en.html. E. C. Kropp Company. “The Sheraton Plaza Postcard.” RICHES of Central Florida accessed April 22, 2019, https://richesmi.cah.ucf.edu/omeka/items/show/7568.